Rollercoasters, the London Eye, aeroplanes, bike wheels and boomerangs — no it's not our plans for the summer holidays, it's just a normal afternoon at a Maths Inspiration gig. These shows for 15-17 year olds are held all over the UK, creating a real sense of excitement thanks to the big venues, huge audiences, comedic MCs and because they are showcasing some of the best maths speakers. We settled back into our seats with hundreds of excited year 10 students in one of the sold out shows in Greenwich Theatre in the first two days of July, to hear just a few of the exciting mathematical stories that were told by the twelve different mathematicians, engineers and scientists over the two days. The shows were being filmed a DVD will be available from September on the Maths on screen website. 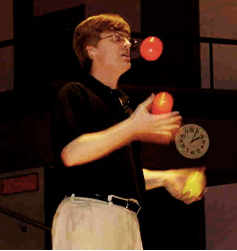 Colin Wright doing some juggling. Rob Eastaway, creator of Maths Inspiration, and composer Richard Harris explored the mathematics of music, reassuring us that we're never going to run out of tunes. Even if you describe a tune simply by a sequence of U, D and Rs, depending on whether the next note along goes up, down or repeats, there is plenty to choose from. Eight notes can be combined in 37=2187 ways like this and for 16 notes there are over 14 million combinations. Once you add in rhythm the musical world expands even further. Who would have thought that part of the Pink Panther theme tune and the East Enders theme tune are described by the same sequence, UUUUUD? The talk ended with a brand new song composed by volunteers and imaginatively entitled Alice. We particularly liked the fascinating jumble of facts we learnt from John Roberts, a structural engineer who as well as designing buildings and bridges has an adrenaline fuelled sideline in rollercoaster and ride designs. He was also the structural engineer for the most popular tourist attraction in Britain, the London Eye. Although we think of these as modern phenomena, coasters and big wheels have been around for hundreds of years and maths is vital in both their structural and economic design. He started with some of the simple calculations for the London Eye that show the economic case for what must have seemed like a massive initial investment. The 135 metre wide wheel moves at 0.25 metres per second, giving x 135 / 0.25 = 1696 seconds, or around 30 minutes for one of the capsules to take a full turn round the wheel. There are 32 capsules and each can carry up to 25 people, meaning 32 x 25 x 2 = 1600 people can ride the wheel each hour. And as each adult pays £20 per ride and each child £15, that amounts to around £28,000 an hour for each of the 10 hours a day, 350 days a year the London Eye operates. It is easy to understand their decision to keep the attraction open after its initial run in the year 2000 finished! 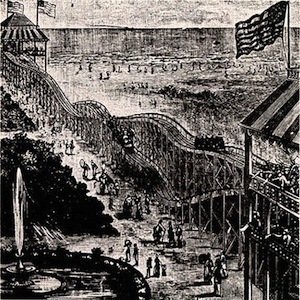 After discussing some of the complexities of building and raising the London Eye, Roberts moved on to something a little more hair-raising – literally – rollercoasters. He gave us a quick tour through the surprisingly fierce rides built over the last two hundred years, including wheeled park benches hurtling down tracks in Paris in 1817, the first recognisable coaster on the sands of Coney Island in 1884 that covered the costs of building it in just the first six days, and my favourite, the Grand National built in Blackpool in 1933 whose twin tracks magically swap sides thanks to an ingenious Möbius strip design. Roberts has designed the biggest coaster in Blackpool, The Big One, which was the largest coaster in the world at the time it was built. Surprisingly, apart from the tow up the initial hill at the start of a rollercoaster, the cars have no motors (or brakes!) and are propelled just by the force of gravity alone. The initial tow gives the car potential energy (equal to where is mass, is the acceleration due to gravity and is the height) which is converted to kinetic energy (equal to , where is the velocity) as the coaster hurtles down the other side of the hill. We can assume that any loss in potential energy is converted to kinetic energy (in reality, some more complicated calculations are needed to account for energy lost through friction from the wheels and air): giving . So for the initial drop of 63 metres in the Big One, the ride goes from almost stationary to 35.2 metres per second or 79 miles per hour in just under 2 seconds, significantly more acceleration than any car you could drive. As well as the forces of gravity, coaster designers must also take into account the centrifugal force that pushes people away from the centre of any turn or loop. At the bottom of a loop the centrifugal force adds to the forces of gravity, creating a total downward force of 4g on the Big One, or four times the usual downward force we feel from gravity. While at the top of the loop the centrifugal force is in the opposite direction to gravity, sometimes cancelling it out to make us effectively weightless for a few moments and lifting us out of our seats. A good reason to make sure you are strapped in tight. Designers must be vary careful to calculate the g-forces accurately: some rides have been mistakenly designed to create forces of 6 g at the bottom of loops causing passengers to have bloody noses. And it could be much worse: 7-8 g would cause passenger's eyeballs to pop out of their sockets and in the most extreme scenario, the Euthanasia coaster (designed by engineer and artist, Julijonas Urbonas, but never built for obvious reasons) is designed to create forces of 10 g for over 60 seconds, to humanely, "with elegance and euphoria", kill all 24 passengers." So when you go for a ride on the Big One or some other coaster this summer, just be thankful that Roberts and the other coaster designers have done the maths correctly to create the greatest thrills while still keeping your eyeballs safe.